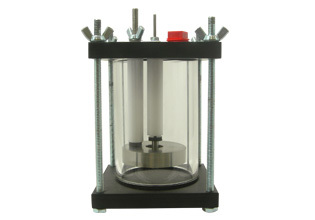 The Tait Cell was developed to address coatings/corrosion studies on flat specimens where the electrolyte under study cannot support a standard reference electrode. The cell was developed to accept a wide range of working electrode shapes and sizes eliminating the need for machining or special mechanical preparation of the sample. The diameter and exposed sample area are approximately 6.35cm and 32cm2, respectively.